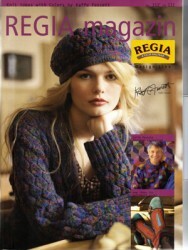 A wonderful selection of patterns using Kaffe Fassett 4-ply sock yarns from Regia - or any basic 4-ply yarn. The designs show off the multi-coloured effects of the yarn beautifully! Patterns include jumpers, cardigans, hats, scarves and socks, with a selection for women, men and children. INSTRUCTIONS ARE IN GERMAN - English language version is also available.